Acer has unveiled its new Chromebook in London. Called the Acer Chromebook 11 C732, the device offers MIL-STD 810G compliance and IP41 rating for water and dust protection. The Chromebook is powered by either an Intel Celeron dual-core processor N3350 or Intel Celeron quad-core processor N3450. The company also claims that the device will offer a battery life of up to 12 hours. IT administrators will find it easy to make updates, configure apps, utilize extensions and policies and more with the web-based management[iii] that makes the Acer Chromebook 11 C732 and Acer Chromebox CXI3 easy to deploy and manage. The new devices both support Kensington locks, so they can be secured to wireless carts or labs. Students will stay protected, since Chrome OS is automatically updated and guards against ever-changing online threats, such as viruses and malware. The Acer Chrome devices support multiple user sign-in, so each student can simply log onto their unique account to ensure their project, Gmail and other information is kept safe, even if the Chromebook is lost or stolen. Storage on Google Drive[iv] protects files, documents, and photos safely in the cloud, and ensures that the most current version is always available. 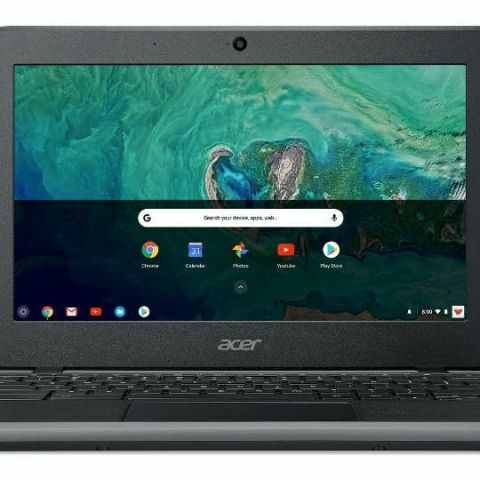 Also, both the Acer Chromebook 11 C732 and Acer Chromebox CXI3 will fully support Google Play at launch, so students will have access to millions of Android apps on Google Play to let them have more fun, be entertained, stay connected and remain productive.